Have you already heard a lot about agile work methods and want to learn about this from a team – as well as a project management – perspective? Do you have significant experience working with agile development methods, yet still need to develop skills when it comes to coordinating these with the business or with other groups? Are you looking for a lean method that you can apply systematically to your project, even when challenges are thrown at you during the course of the project? Are you looking for a project management framework to support the Scrum methodology? Do you want to learn about principles, processes, roles and responsibilities, and discover the potential of planning in agile environments? Do you want to combine agility with governance? This course addresses all of the above questions, while giving equal focus to the topics of quality and governance. Particular emphasis will be given to the specific philosophy and approach that are key to ensuring the success of a project in an agile environment. Last but not least, the course also covers communication, prioritisation and challenge management. At the end of the course, you will know how a high degree of flexibility can be an asset for securing strategic advantage – even in tricky situations. This framework can be successfully linked with the agile portfolio management AgilePfM®, the agile programme management AgilePgM® and the agile business analysis AgileBA®, as well as Facilitation™. A particularly enlightening highlight of this course is dealing with a scenario using Challenge of Egypt® Agile. Participants are only eligible for a more advanced level of exam in a specific methodology if they have successfully passed the exam at the level immediately beneath it. This course is based on the Agile Project Management guidelines issued by the APMG and the Agile Business Consortium. 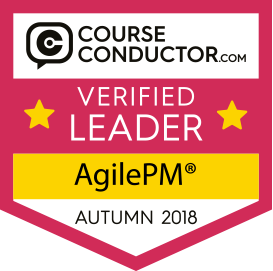 You can find AgilePM Essentials clips on our Youtube channel, which illustrate the most important elements of this method.